Sunday June 23 1907 Will went to the pasture in morning. I baked some cookies and we picked a few strawberries. I rested a little in the morning and laid down most of the afternoon. I feel very tired from my weeks work. The home folks are without help as Josephine had to go to her sisters for awhile. It was warm today and things are growing nicely. 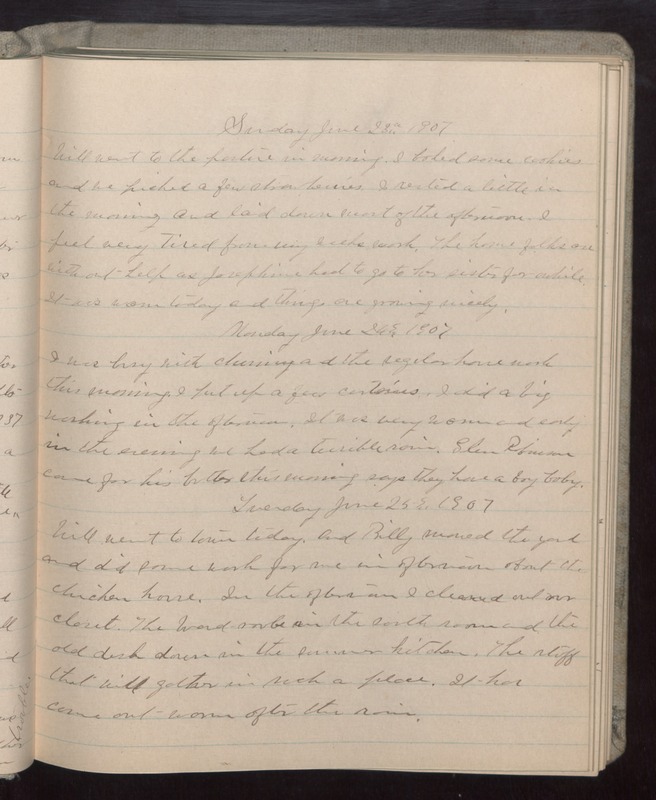 Monday June 24 1907 I was busy with churning and the regular home work this morning. I put up a few curtains. I did a bit washing in the afternoon. It was very warm and early in the evening we had a terrible rain. Glen Robinson came for his butter this morning says they have a boy baby. Tuesday June 25 1907 Will went to town today. and Billy mowed the yard and did some work for me in afternoon about the chicken house. In the afternoon I cleaned out our closet. The [wood-work?] in the south room and the old desk down in the summer kitchen. The stuff that will gather in such a place. It has come out warm after the rain.